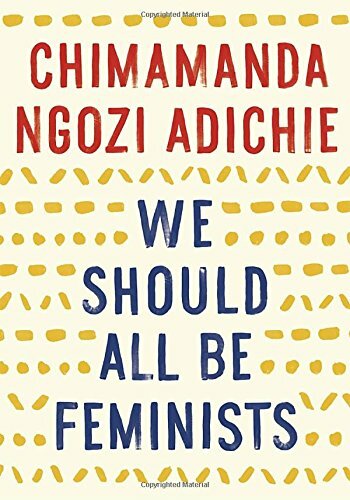 I have been meaning to read We Should All Be Feminists for some time and then finally, today, on International Women’s Day of all days, my sister lent me her copy. And, because it’s only 52 pages including the Introduction and the About the Author section, I read it with my morning granola. And it is brilliant. I will say that one of the personal reasons it appealed to me is that my fiancé is African. Not from Nigeria, but from a small, West African country that seems to have a lot of the same gender stereotypes that Nigeria has. And therefore a lot of what Adichie talks about in her book mirrors discussions that I’ve had with my own fiancé. He has been in the US for over a decade and therefore has become somewhat Americanized. But he still holds with quite a few traditional views (not necessarily acted upon, but there), and as a feminist, I find some of them, frankly, offensive as hell. This book both helped me understand why he holds the views that he does, but also reinforced my belief that it’s okay for me to be offended by some of his culture’s beliefs. This, in particular, has been a long-standing conversation with myself and fiancé. He recognizes that the way things were done in the past are not necessarily how things should be done in this day and age, but often defaults to saying “well, that’s just our culture.” But, I agree with Adichie that it doesn’t have to be. And I know we probably won’t change what our parents do/think, but, if enough of us change what we do, then we can influence the next generation to do better. I’ve been a fan of the author, Chimamanda Ngozi Adichie, ever since reading her book, Half of a Yellow Sun, but I am an even bigger fan now. Although many of her experiences are specific to Nigeria, I still felt connected to what she was saying (even beyond the fact of my fiancé) and think that a lot of women (and men) will recognize themselves in this book. It’s wonderful and I highly recommend it for everyone. Share the post "Happy African Feminist"
I love reading and can think of nothing better than reading for a cause. Very excited to be part of CB9! Thanks for such a personal, inspiring review! Adichie has such a beautiful way with words, it’s amazing. And this book was really impactful for such a small thing. I hope you *do* get it for your birthday, and I hope you enjoy it! What a wonderful review. Good luck with your fiancé. I love the personal reviews the most, and I loved this book as well. Lovely review and congrats on your engagement. Thank you, faintingviolet. I wasn’t sure how people would receive a more personal review so it’s nice to get this sort of feedback from all of you.